Over the last decade, European labour markets have seen a surge in the number of older workers in work and a continuous decline in their unemployment rates. A lot of young and middle-aged workers lost their jobs in the Great Recession, but not so the older age group. This favourable state of affairs means they receive less policy attention, which is unfortunate for older workers who suddenly find themselves without a job. It is common knowledge that unemployed workers over 50 find it harder to get work than their younger counterparts. Data show that they tend to remain unemployed longer once they have been let go, for several reasons. On the one hand, employers often stereotype older workers, thinking them less productive, more expectant of higher salaries, or likely to have health problems. On the other hand, older workers can be less willing to change occupation or to look farther afield if job opportunities are scarce in their local area. Such disadvantages are compounded when there is a collective dismissal. In a situation where a big pool of workers is competing for the same jobs, especially in a region where employment opportunities are limited, older workers will often lose out to their younger colleagues. Why focus on older workers? This is an issue that warrants specific attention – not only because long-term unemployment is as damaging for older workers as for any other age group, but also because of the consequences for our societies. European countries, like other countries around the globe, have ageing populations. This poses a threat to the sustainability of social welfare systems, as lower numbers of workers will have to finance increasing numbers of pensioners. 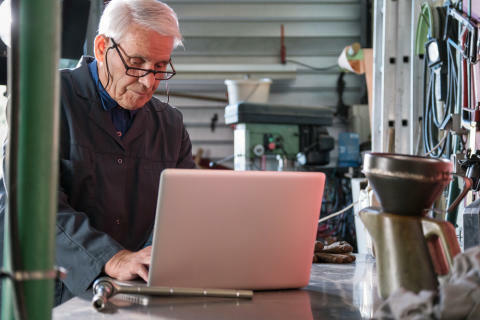 Governments across Europe are attempting to maintain the balance between the two by raising statutory retirement ages and introducing other measures to extend working life. While such steps are having an impact, they are only part of the solution. 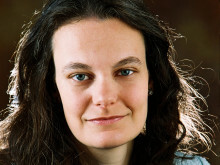 Measures are also needed to prevent redundancy from resulting in long-term unemployment among older workers, but not many schemes exist at present. 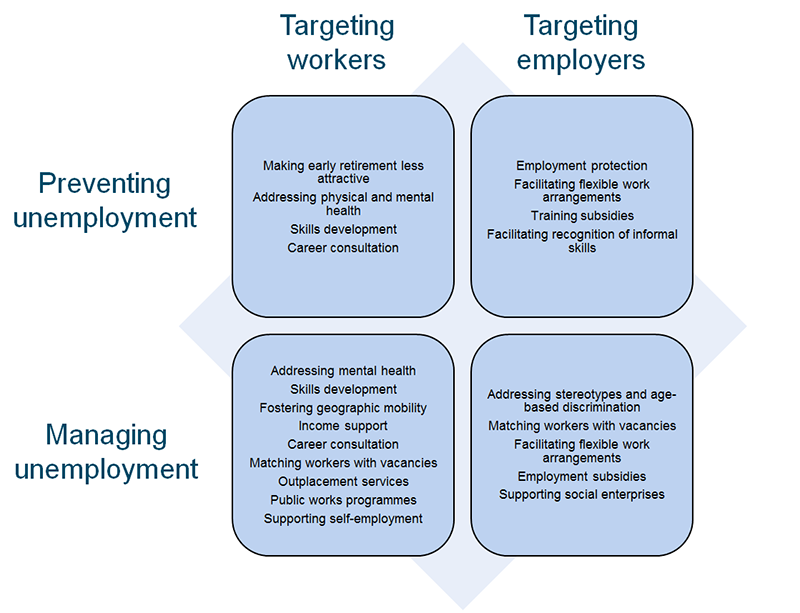 Across the Member States, a relatively small number of measures specifically target redundant older workers, but there is a wide spectrum of initiatives either tackling redundancy (irrespective of the age of the target group) or addressing the integration of older workers into the labour market (irrespective of the reason for unemployment). They target either the workers themselves or prospective employers, and fall into two broad groups – those that anticipate potential future redundancy and prepare for it, and those that manage current redundancy situations. The figure below shows what such public interventions typically focus on. Because older workers have difficulty getting back to work once they become unemployed, efforts must be made to prevent that from occurring in the first place. This means measures to ensure workers’ skills don’t become obsolete and to tackle health problems at a younger age so that these issues do not compromise workers’ employability when they are ageing. In the specific situation of a redundancy, interventions need to kick in early, during the notice period after an announcement. That gives employment services and the affected workers more room to work on a smooth job-to-job transition without a spell of unemployment. Measures that give just one type of support are less effective than comprehensive packages that combine, for example, advice, training and employment subsidies. Ideally, the advice component should be one-to-one, tailored and frequent, but it could also include group-oriented elements such as peer exchanges among older unemployed people. Training should extend beyond the classroom to take in on-the-job experiences. And while employment subsidies can help to overcome employer reticence, governments should take care that subsidised jobs do not substitute existing employment, and that the job continues after the subsidy ends. Governments also need to look beyond labour market policy to social policy because that also plays a role. 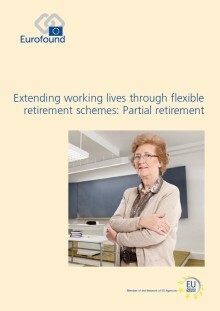 In many Member States, older workers have an alternative exit route through early retirement or social welfare schemes. If these are easy to access and generous, redundant older workers might not be motivated to look for a new job. This underlines that different policy areas need to be aligned – for example by offering financial incentives to remain in the labour market while imposing financial disincentives on alternative exit strategies. ​Partial retirement schemes can be an important part of the solution to improving sustainability of Europe’s pension systems.